The tables for sizing roof members assume that a conventional roof covering. such as asphalt shingles, cedar shakes or lightweight metal roofing, is being installed. Some roof coverings, such as terra cotta tile, are much heavier and hence the roof members must be sized accordingly. The following points should be considered when sizing roof framing members supporting heavier than normal roof coverings. Obtain the unit weight (pounds per square foot or kilograms per square metre) from the manufacturer, and add this to the local snow load. Use this adjusted snow load to si/e roof framing members. If the adjusted snow load exceeds that found in the tables, consult with a competent structural designer. •* If trusses are being used, notify the truss manufacturer of the additional load due to the heavier roof covering so that tnese may be sized properly. Carefully observe all requirements for bracing and strapping that may be required to properly install and support the roof covering. 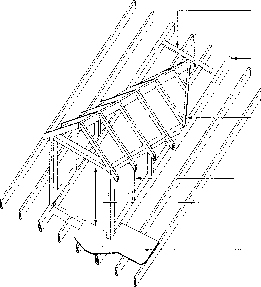 a roof strut is used to transfer the load from the hip or valley rafter to the beam. 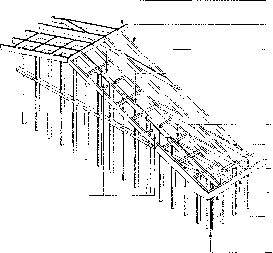 Where intermediate support is required for a few rafters in the end section on a hip-type roof, a simple form of support can be provided by a beam (sometimes called a "strong-back") consisting of two 2 x 4 in. (38 x 89 mm) members nailed together, set on edge and nailed to the bottom of the rafters. This beam is in turn supported at points along its length by 2 x 4 in. 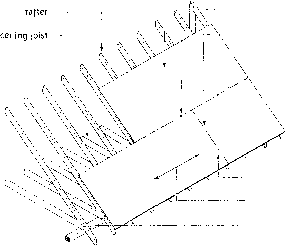 (38 x 89 mm) struts radiating from a common point of support on the centre loadbearing wall. The angle of any strut should not be less than 450 to the horizontal. The ends are cut to fit the selected angle and securely nailed in place. Hip and Valley Rafters should be about 2 in. (50 mm) deeper than the common rafters (Figs. 54B, 56 and 58). This additional depth provides full contact with the angle-cut of the jack rafters. In hip roofs, the jack rafters are nailed to the hip rafters and wall plate. Where a valley occurs, the jack rafters are nailed to the valley rafter and ridge. Dormers, such as small gable dormers, are framed so that the rafters at each side are doubled to support the side studs and valley rafters. The top end of the valley rafters are supported by a header (Fig. 59). The most common method of construction is to install the roof sheathing before the dormer is framed, and then saw the sheathing flush with the framing members around the opening. A bottom plate added on top of the sheathing supports the side studs enclosing the dormer and also serves as a nailing base for the wall sheathing. If future expansion is contemplated or additional rooms are to be built in the attic, consideration should be given to framing the roof to accept future dormers when the house is built. Typical dormer framing. After roof sheathing is applied, blocking is added between side studs at roof line to provide nailing support for wall sheathing. Wide projection at gable end supported by "lookout" rafters. ridge beam rafter top plate of gable end wall blocking between lookouts to support roof sheathing and inner edge of soffit covering lookouts at 24" (600 mm) o.c. Narrow projection at gable end. 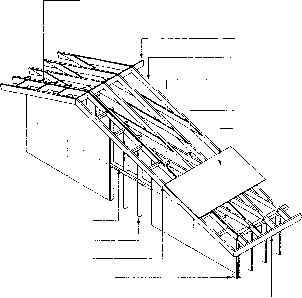 Rake rafter supported by ridge beam, rafter header, blocking and roof sheathing. After the roof-framing members are up, the gable-end studs are cut to fit and nailed in place. Studs in unfinished attics may be placed with the wide face parallel to the wall. The ends of the studs are then cut to fit the angle of the rafter and are toenailed to the wall plate and to the underside of the rafter with four 2 1/2 in. 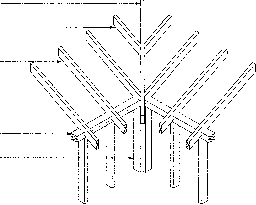 (63 mm) nails at each end (Fig. 60). Construction of the roof projections commonly used at the gable ends is shown in Figures 60 and 61. As with eave projections, the soffit is covered with 1/4 in. (6 mm) sanded plywood or pre-finished aluminum or vinyl sheets, and fascia board is added to the outside framing member. Roofs which project less than 12 in. (300 mm) over the gable-end wall usually terminate with a framing member sometimes called the rake rafter (Fig. 61). A1 in. (19 mm) nailing strip is'fastened to the rafter located above the gable-end wall. Blocking spaced at 24 in. (600 mm) on centre is used to support the soffit covering. This blocking is toenailed to the nailing strip and end-nailed to the rake rafter. The soffit covering is then installed and nailed to these supports. A fascia board is added in the manner previously described. What is a double header in construction? How to build a gable rake? How to build a dormer roof? What angle are valley raffters that fit to the double raffters on a pitched dormer? Can i cut the top plate in roof?